SUBANG JAYA: Besides that all important gift for words, a love for debating and keeping clued in to local and world news helped two 15-year-old students to walk away with the top prizes for Forms One to Three (category A) at the Sunway-Oxbridge Essay Competition prize giving and certificate ceremony today. There were 3,763 entries, a 70 per cent increase from last year’s 2,205 entries, bringing the total number of entries received for the five years the competiton has been held since its debut in 2013 to 13,740 from 388 schools nationwide. In this year’s competition, secondary school students were invited to submit original English essays on their vision for Malaysia in 2050 and their roles in achieving them. The habit of reading newspapers daily helped Soh Zoh Lynn of SMK Bandar Damansara, Petaling Jaya, take the top spot in category A. She won RM5,000 and a Sunway bursary valued up to RM26,000. She said her English teacher and her parents had motivated her to take part. ”I read the newspapers to find out what’s happening around the world and all the hot issues. That’s where I get my inspiration to write my essays,” she said at the prize giving ceremony at Sunway university today. Category A second prize winner Hilman Irfan Hilmi of Kolej Melayu, Kuala Kangsar, attributed his win to being up-to-date on current affairs and world issues. He received RM3000 and a Sunway bursary valued at RM15,000. ”To be honest I didn’t do much, just what I do daily. I have an almanac at my dormitory, which I read every day. I am a debater and it is common for us to know about world events and current affairs. The competition was organised by the Sunway Group, Oxford and Cambridge Society Malaysia, Jeffrey Cheah Foundation, Sunway University and Monash University Malaysia, with support from the Education Ministry and Sunway PALS. There was no third place winner in category A. In the Form Four and Five group (category B) there was no first place winner. The second prize was awarded to N. Sujendra Kumar of SMK USJ12, Subang Jaya. He took home RM3,000 and a Sunway bursary of RM15,000. 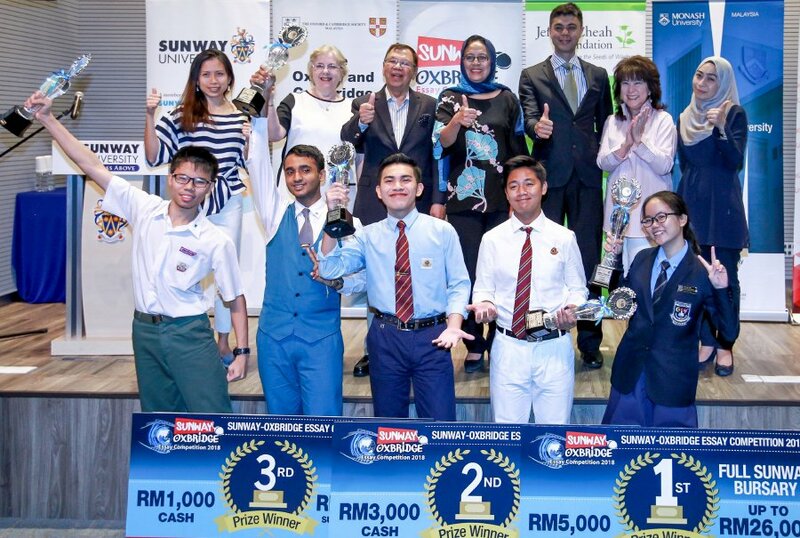 Maktab Rendah Sains Mara Kuala Kubu Bharu’s Aaron Azree Kamarul Azman and SMK USJ 12, Subang Jaya’s Jonathan Loh Kah Hoong tied for third place, winning RM1,000 and a Sunway Bursary worth RM10,000 each. There were also 10 consolation prizes of RM500 and Sunway bursary of RM5,000 in both categories.